New climbers' frame tested out by Robert Gesink and Laurens Ten Dam on the Mur de Huy. The Tour de France and Paris-Roubaix are the usual races at which to launch new bike models, but Bianchi seems to have chose Fleche Wallonne as the occasion to roll out a new prototype race bike. The UCI’s list of approved bikes shows a mysterious “Specialissima CV” which was only added to the list in January, so this is our best guess as to the name of the new frame. 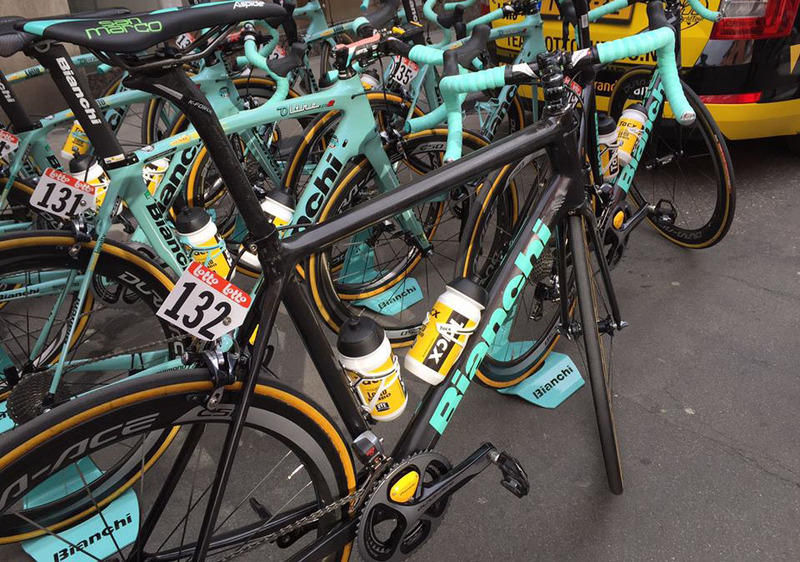 Bianchi-sponsored Team LottoNL-Jumbo had been given two of the new Specializzima CVs, with the two of the team’s climbers, Robert Gesink and Laurens Ten Dam, being selected to put the all-black bike thorugh its paces at the Belgian classic. The straight lines of the Specialissima CV set it apart from most of Bianchi’s other bikes, particularly curved tubes seen on the high-end Oltre (seen in the background of the above photos) and Infinito CV. The choice of rounded rather than aero-profile tubes is also interesting, suggesting that this could be a new climbers’ frame to sit alongside the more aero-orientated Oltre. The CV in the name suggests that this frame contains Bianchi’s CounterVail technology, a feature which acts to dampen road vibration, something that we really loved when we tested the Bianchi Infinito CV Disc late last year. The bikes that Gesink and Ten Dam rode at Fleche Wallone were largely decked out with the same components as the rest of the team, with Shimano Dura-Ace Di2 groupset and Dura-Ace C50 wheels. They also used FSA K-Force seatposts, in contrast to the aero Bianchi posts on the rest of the team’s Oltres, and FSA K-Force bars and stems.